Yeah, it’s been like, forever. But I’m still alive, and around, and still writing and editing and swording and translating. I hope all of you are well and feeling reasonably successful in your endeavors. I’m still plugging away, feeling like it’s three steps forward and two steps back, but at least I’m making some small headway. While I’m here — I have yet to receive my copy due to logistical kerfuffles, but I’m eagerly awaiting Tim Rivera’s translation of Godinho’s Art of Fencing! Not only has he translated the text, but he’s also included a lot of additional material, extracting and collecting key points in easily findable ways. In other news, I presented a taster course workshop on Godinho at Swordplay 2017 which was well-received, and learned a ton from other presenters (including Skye Hilton and Steaphen Fick), and had a lot of (never enough) bouts with fantastic friends old and new. Somehow, I ended up taking fourth place in mixed medium saber, which was a blast! At any rate, I’m hoping to finally post up the remaining translations I’ve done of the off-hand weapons in Oplosophia (except dagger) before poking around a bit in other texts, mainly to collect and compare approaches to foundational techniques (atajo, right angle guard and defense, measure of proportion and proportional measure, that sort of thing) and maybe track how things evolve over time. I’ll post excerpts of my translations where appropriate. Finally, I’m considering setting up a Patreon where folks can pay me per translation. It’ll be a single-fee structure, because I don’t have the time or the organization to supply appropriate bonuses and goodies, and it’ll be per translation and not per month (at least not yet). 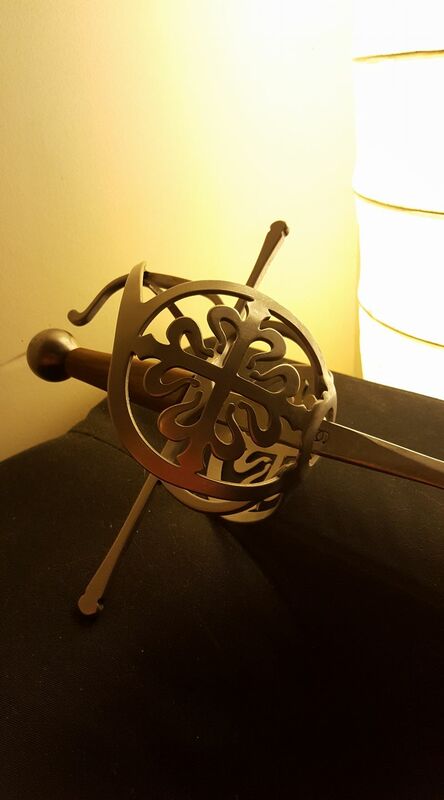 In the meantime, I’ll leave you with a picture of my new custom Castille Armory hilt. Tagged Castille Armory, destreza, HEMA. Bookmark the permalink.